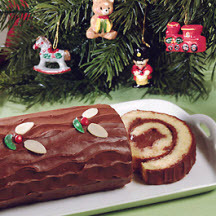 Start a new holiday traditional with this whimsical treat that's sure to delight bright-eyed youngsters and the young-at-heart. Lightly grease 15 1/2 x 10 1/2 x 1-inch jelly roll pan. Line bottom with waxed paper. Grease again. Set aside. In small saucepan, bring 1/2 cup sugar and water to boiling. Reduce heat. Simmer 1 minute. Set aside to cool. In large mixing bowl, beat egg whites with cream of tartar at high speed until foamy. Add 1/3 cup of the sugar, 2 tablespoons at a time, beating constantly until sugar is dissolved (rub just a bit of meringue between thumb and forefinger to feel if sugar has dissolved) and whites are glossy and stand in soft peaks. In small mixing bowl, beat egg yolks at high speed until thick and lemon-colored, about 3 to 5 minutes. Gradually beat in remaining 1/3 cup of the sugar until blended. Beat in vanilla, almond extract and salt. In small bowl, stir together ground almonds and flour. Sprinkle over whites. Add beaten yolk mixture. Gently, but thoroughly, fold yolk mixture and almond mixture into whites. Pour into prepared pan. Gently spread evenly. Bake in preheated 400°F oven until top springs back when lightly touched with finger, about 10 to 12 minutes. Dust clean tea towel with powdered sugar. With spatula, loosen cake from sides of pan and invert onto prepared towel. Carefully pull waxed paper off bottom of cake. Trim all edges with serrated knife. Stir liqueur, if desired, into cooled, reserved sugar syrup. Spoon evenly over inside surface of hot cake. Starting from short edge, roll up cake, rolling towel with cake. Place wrapped roll seam-side down on wire rack until cool, about 30 minutes. Carefully unroll cake. Spread with about 1 cup chocolate frosting. Reroll. Place seam-side down on serving platter. Spread with about 1 cup additional frosting, using small spatula to create tree-bark effect. Garnish with sliced almonds, candies and cherries, if desired. Tip: If prepared in advance, baked and cooled cake may be frozen without filling. Wrap well with aluminum foil or plastic wrap. To thaw, let wrapped cake stand at room temperature about 1 hour.